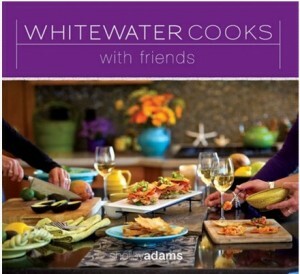 Shelley Adams of Nelson, BC is the author of the Whitewater Cooks series. Adams and her husband, Mike, owned Whitewater Ski Resort where she ran Fresh Tracks Café. Patrons began asking for recipes and so her first book Whitewater Cooks: Pure, Simple and Real was born. Her latest book, Whitewater Cooks with Friends, is currently number one on The Association of Book Publishers of British Columbia. It is a collection of recipes from Adams' friends as well as her own that focuses on simplicity and are not labour intensive. Your books have garnered a lot of attention via word-of-mouth. What do you think draws people to your recipes? I think people are drawn to my books because the recipes are delicious, healthy and easy to prepare. I also think people are initially drawn to the books because they are beautiful to look at and the food photos are gorgeous and make you want to prepare and eat the food right away! Once someone buys one of the books, they tell their friends. Word of mouth has certainly played a big part in my books from all the people that have purchased the books or have received them as gifts. However, they have received some very positive media as well such as a five page spread in MORE magazine, an article and photo in the NY Times and interviews on BC Almanac with Robert Forsythe and Global television with Caren McSherry. That really helped get the word out. Thanks everyone! What is your cooking style when at home? Do you prefer more simplistic meals or do you like to go all out? My cooking style at home is exactly the same as my cookbooks! They are all my favourite recipes that I have been making for years and to have them all in three books in my kitchen is very handy! Everyone should write their own cookbooks for that reason! My style is delicious food that is easy to prepare, healthy and beautiful to look at! From your book Whitewater Cooks with Friends, what is an easy recipe that people must try? What is the fan favourite from this book? All of them! But with recent feedback on my latest book Whitewater Cooks with Friends, people are loving Margie’s Pork Tenderloin Saltimbocca, the Paella Chowder, Pauline’s Cranberry Bars, Rolled Pavlova , Blake’s Miso Panko crusted Sable Fish and the Pacific Sashimi Towers…. What was the most challenging part of the book writing process for you? There are lots of challenges when writing cookbooks. Selecting the recipe content is very important and challenging because I like to share recipes that people will actually make and not just look at the photo and feel overwhelmed. Another big challenge is the writing, editing and proofing of each recipe. I want to ensure that anyone from kids to dads to kitchen pros can recreate the recipes with ease and fun and feel proud of the outcome. The photography can be challenging because almost everything is shot outside in natural light and the weather in B.C can change in seconds! Also food needs to be photographed as soon as it is ready and that can be tricky for the photographer! The part I love the most is the creativity of designing the setting for each of the photos for the recipes, the cover, back cover and layout of each page. The table, napkins, flowers, dishes and background are very important for me when presenting the food. The cover is the hardest to pick because it is the image and impression people will see on the shelf first. I want that person to notice it, pick it up, open the book and LOVE it! I know what they find inside will make them happy! When writing this book, did you have a specific audience in mind? The audience I had in mind was someone like myself that loves to eat good healthy food and doesn't want to spend a ton of time in the kitchen. I wrote the book wanting to share more of my recipes as well as recipes from my friends with people who work full time, new mothers, skiers, bike riders, entertainers, caterers, cooks and friends. Combine yeast flakes, water, soy sauce, vinegar, garlic and tahini in a blender or mix with a hand-held mixing wand and process until smooth. Add oil in a steady stream and blend until incorporated. Store in a glass jar or a plastic squeeze bottle in the fridge. Place the tofu in a glass baking dish. Mix together soy sauce, sesame oil, rice vinegar, sweet chili sauce and pour over tofu. Cover with plastic film and marinate for an hour or longer in the fridge, turning the tofu over a few times. Place the panko crumbs on a plate. Remove the tofu from the marinade and dip each piece into the cornstarch mixture and then the panko, pressing firmly so the crumbs stick well. Heat a saute pan to medium and add oil. Place the tofu pieces in the hot oil and saute for about 2 minutes on each side or until golden brown. 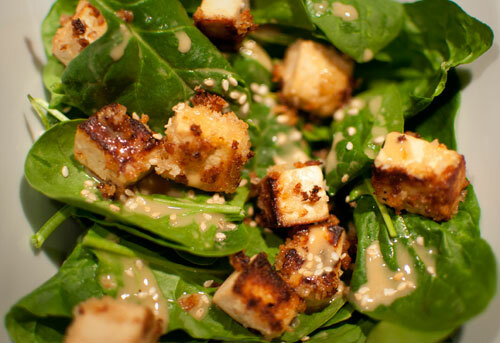 Sprinkle with toasted sesame seeds and drizzle with dressing.